I do not think she is a full reefer vessel; maybe she could carry some bananas. A long time ago I read in a Dutch stamp magazine that she was one of the ES class of the Dutch company KNSM, and I think that is right, which ship of the class is depict I am not sure, but she carried the Koninklijke Nederlandsche Stoomboot Maatschappij N.V., Amsterdam (KNSM) funnel colours, black with a white band. In the book KNSM by P.Mulder I can find 15 ship of this class which were built between 1959 and 1963 on Dutch yards for the KNSM. ACHILLES, built in 1959 was the lead ship of this class, her details I will give, and the other 14 ships are about the same. The HERCULES was the last of this class built in 1963. Tonnage 5.711 gross, 3.186 net, 7.140 dwt., dim. 401.2 x 57.7 x 28.9ft. Powered by two 7-cyl Stork diesel engines, 6000 hp, speed 17.5 knots. During 1967 lengthened by 9.75m., tonnage increased to 6.237 gross, 3.475 net, 7.680 dwt. All the other ships of this class were lengthened with the same length on Dutch yards between 1966 and 1970, except the SOPHOCLES who sank after a fire in the cargo on 19 February 1965, 730 mile w.n.w of Oporto, Portugal on a voyage from Puerto Limon to Amsterdam. The class was sold in the seventies for further trading. ACHILLES was broken up at the Sachana Shipbreaking Yard, India in April 1987. 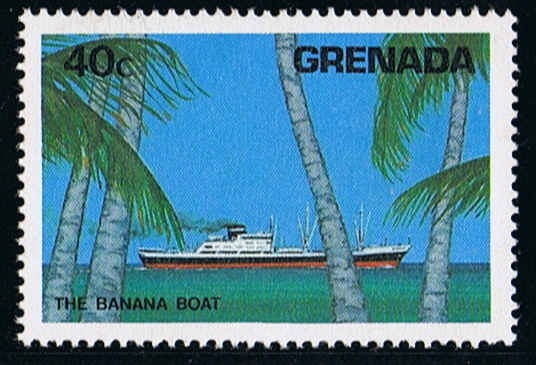 Grenada 1984 40c sg 1342. Source, The all mentioned book and Register of Merchant ships completed in 1959.